NIA CHARLESTOWN NEVIS (April 28, 2016) – Minister of Agriculture on Nevis Hon. Alexis Jeffers says construction work for the new wing of the government-owned Abattoir at Prospect is ahead of schedule. He made the disclosure after touring the construction site on April 27, 2016. Work on the project commenced in early February, two weeks after the official ground breaking on January 26, 2016, with August earmarked for completion. “Based on the timelines we are looking at we are hoping to have construction completed somewhere around August but at the rate at which we are going with the construction, I believe we should be done by maybe July. “It means we may have usage of this building in advance of the period of time that we would have earmarked for completion,” he said. Mr. Jeffers stated that the walls were constructed and plastering was in an advanced stage. The roof was up and he expected the galvanise sheeting to be in place sometime next week. He used the opportunity to commend the contractor Edmund Jeffers and his team for their hard work and dedication to the project. According to Mr .Jeffers, the new wing for the abattoir is a project that was contemplated 20 years ago and over the years was budgeted for but is, only now, becoming a reality. The Minister said the new wing is envisioned to bring greater improvement and to the complement of services already offered at the abattoir. “It will house a smoke house, smoke room, production area, walk-in freezers, staff quarter and also toilet facilities. It is an extension of what we currently have from the older site. “There will be a connection from one section to the next, so it is an expansion of the overall square footage of this compound here at Prospect.” he said. However, the Agriculture Minister noted that the Ministry’s main thrust at the moment is to provide linkages in all areas of agriculture. So far it has upgraded and enhanced the fencing at government-owned estates in Maddens and Indian Castle and reintroduced forage banks at both estates. 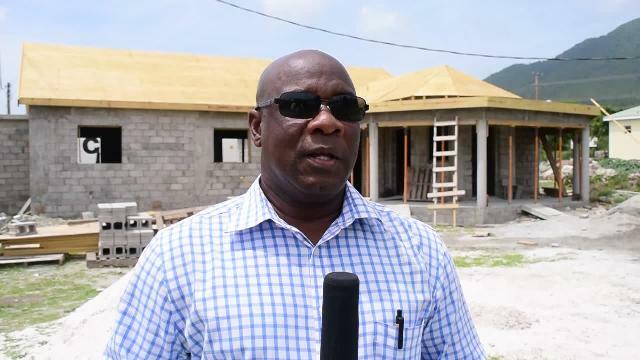 He said the Ministry has also embarked on construction of an additional wing for the Veterinary Clinic at Prospect, for the overall quality and improvement in livestock production on Nevis. “All this is being done for the safety and for the health of all our citizens because we are producing our meat here on Nevis and we know exactly what goes into the production of livestock which in turn impacts on the quality of meat. “We have had some commendations being passed on to the staff here at Abattoir in terms of the work they have done and also for the new products they continue to bring on line, onto the market,” he said. Mr. Jeffers used the opportunity to commend Manager of the Abattoir Gary Griffin and his staff for what he says is their outstanding work to ensure the production of quality items for consumption.